At both the 8.00 am and 11.00 am services, we use the Scottish Liturgy (1970). At the 6.30 pm service, we use the 1982 Liturgy (the Blue Book). The Church uses the New English Hymnal. The collect, readings and prayer list are provided on a separate sheet. 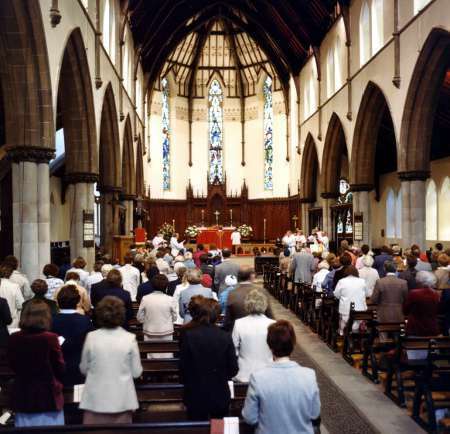 There is a weekday service on a Wednesday using the Scottish Liturgy (1970). Details of future services are published on a later page in this section of our website. After the 11.00 am service on Sunday and the 10.00 am service on Wednesday, there are refreshments — coffee, tea and, occasionally, cloutie dumpling served by our coffee ladies. This is an excellent way to meet other members of the congregation. We warmly invite you to join us at any of these services.